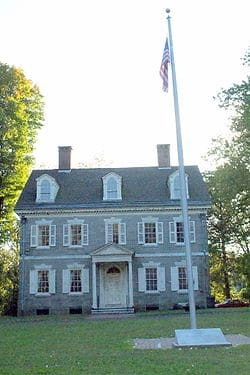 Upsala is a historic mansion in Mount Airy, Philadelphia, Pennsylvania that was the site of an American concentration of forces during the Battle of Germantown, used as a staging ground for the attack on British forces at Cliveden across the street. Upsala was built in 1798 by John Johnson, III, the grandson of the builder of the nearby John Johnson House, who is said to have bought the land in 1766. It stands directly across Germantown Avenue from Cliveden, Benjamin Chew’s mansion. Although he was raised as an English-speaking Quaker, Johnson was descended from one of Germantown’s earliest settlers, Dirk Jansen. Johnson married Sally Wheeler in 1801, and together they had nine children at Upsala. Dirck (or Dirick) Jansen owned the land before 1775. 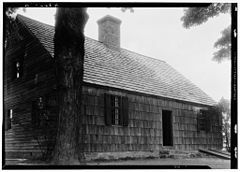 The older, rear part of the house was built around 1745. John Johnson, Sr. is said to have bought the land in 1766. There is speculation over whether father or son owned the house first. John Johnson, III inherited the property in 1797 and built the front section of the house. It was a staging ground of the Continental Army at the Battle of Germantown in 1777. The building was added to the National Register of Historic Places in 1972. 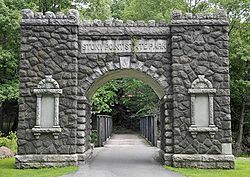 It is a contributing property of the Colonial Germantown Historic District.